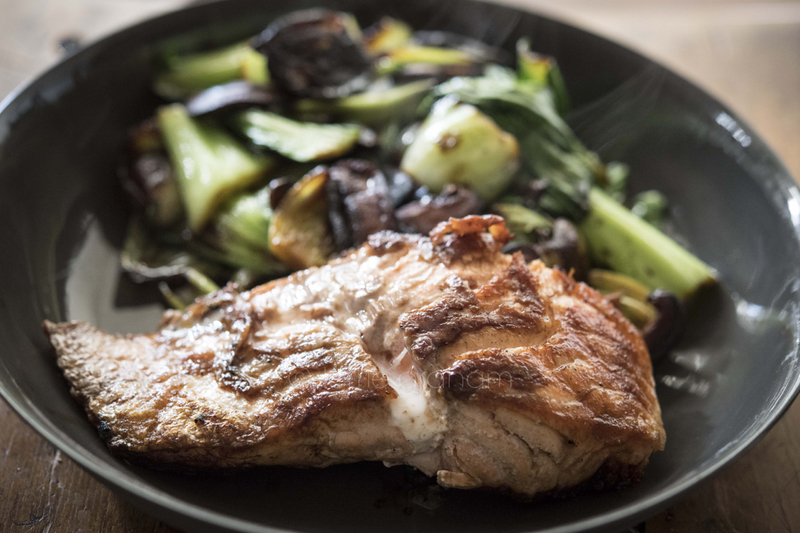 This salmon with greens and shiitake mushrooms recipe from Nigella Lawson has become a staple of mine for a mid week healthy dinner – quick and easy to prepare. This is from “Nigella Bites”, in the “Templefood” chapter. You will have waded through a lot of butter and items like ham in Coca-Cola to get to this healthy recipe. In a heavy- based pan, fry the garlic in the oil until it is warm but not catching. Add the sliced mushrooms together with the Choi sum stalks, stirring everything together for a bare minute or so. Cover the pan and cook for about 5 minutes, remove the lid and add the roughly chopped choi sum leaves, soy sauce and sesame oil, then let it food for another 2-3 minutes until the leaves have wilted. Pile the mushrooms and greens on the plates with the salmon and, pleasurably, eat….. This has become a regular staple in our household. It is simple and quick, healthy, and delicious. Bravo !